A T&C guide to the colorful island nation. When you're in the mood for a beach vacation and can't figure out where to go, it may seem like most of the Caribbean islands blend together. They offer basically the same experience—soft white sand, warm turquoise water and blinding sun. Your basic screensaver situation. Right? And then you consider Curaçao. 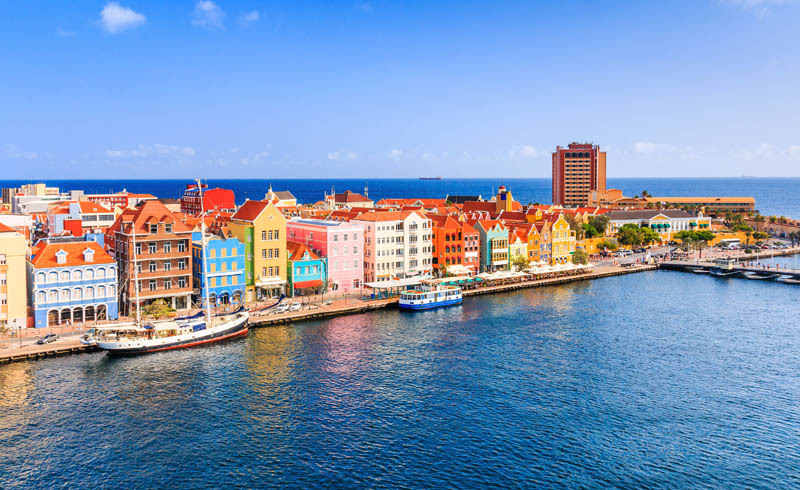 Curaçao is grouped with the ABC Islands (Aruba, Bonaire, and Curaçao), and is an independent country within the kingdom of the Netherlands. Located about 40 miles north of Venezuela, the island has a fascinating history. While it's believed that the first settlers were the Amerindian Arawaks some 6,000 years ago, the nation spent the last few centuries colonized by a series of European countries. The Spanish came in the 16th century, followed by the Dutch in the 17th, then a huge amount of Jewish refugees and African slaves in the early 18th century. From 1800 to 1815, the country was British, then Dutch, then British, and then Dutch again. This clash of cultures has resulted in a delightfully layered nation where the official languages are Dutch, English, and Papiamentu, which is a mix of Dutch, Portuguese, Spanish, and some African dialects. 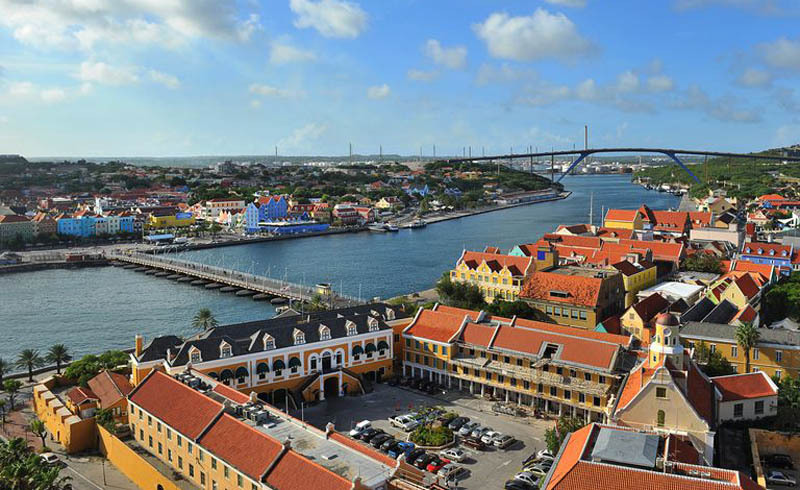 A glimpse of the capital of Willemstad is another reminder, as the candy-colored buildings fighting for harbor views resemble nothing less than a Caribbean Copenhagen. All that history and culture, food and art—and oh, the beautiful beaches—means there's a little something for every vacation style in Curaçao. Here's how to max out your experience. 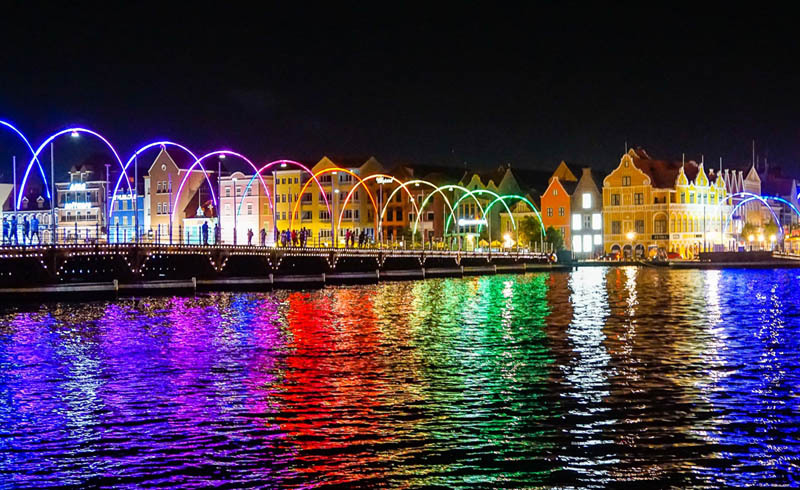 Curaçao is lovely all year 'round. While it gets rainy in late fall (October through December), the storms tend to be fast and furious in the afternoons and then the sun comes right back out. December to April is peak travel time, as Americans seek to escape the winter, so hotels and flights may be more expensive during this time. Due to its location, Curaçao is generally safe from hurricanes when other islands in the Caribbean are not as lucky come late summer. See how the colonial cultures converge in the capital city, starting perhaps at the dramatic Queen Emma bridge. You can feel the gentle sway of the bridge when walking across, and it's an ideal spot for taking photos of the brightly colored buildings along St. Anna Bay. Check out the Mikvé Israel-Emanuel Synagogue with its sand floors; it was built in 1732, making it the oldest synagogue in the Americas, and there's a small but sweet museum of Jewish artifacts attached. You may also enjoy the floating market, where fishing boats from Venezuela dock to peddle the day's wares. Overall, the town is very walkable and lively, and it wouldn't be a visit to Curaçao without a day in town. A deliriously fun way to get to know the island, particularly its rockier terrain and infamous caves, is an ATV tour. Eric's ATV Adventures offers an array of tours, with one along the east side of the country that includes a visit to an aloe vera farm, or one on the west that involves cross the red "desert" of the San Pedro plateaus. There's even an option that combines ATVing and jumping into the water to snorkel. Tours start at $98 for 3.5 hours, and include safety training—and the pace can be as slow and feel as safe as driving a golf cart. Huge swaths of Curaçao's coast is undeveloped or untouched entirely by hotels, which means the fringing reef around the island is remarkably healthy compared to other Caribbean nations. The snorkeling is great and diving even better, with Cas Abou being a popular destination for tourists and locals alike. Right on Cas Abou is B Diving and Watersports, which offers lessons for all ages and skill levels, certification, and equipment rentals; Ocean Encounters is another beloved school, and offers nighttime dives to see fluorescent fish. 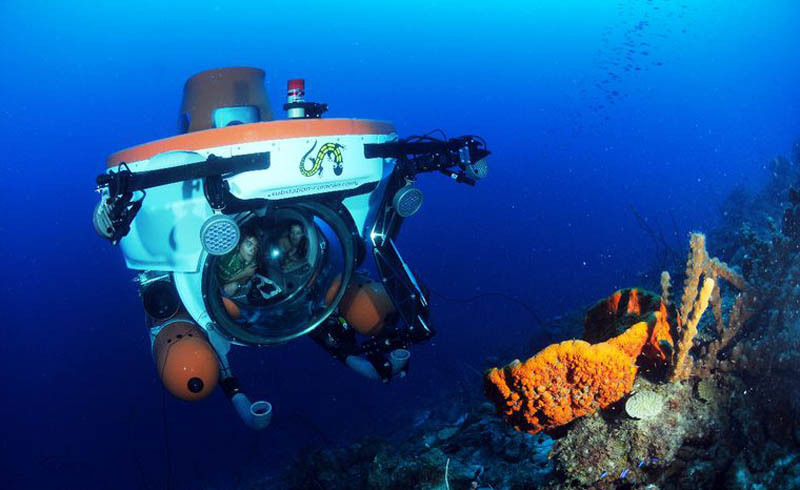 For a once-in-a-lifetime experience, Substation Curaçao offers mini-submarine tours traveling up to 1,000 feet below the surface of the sea, where coral, fish, and shipwrecks can be spotted (and eventually, sunlight all but disappears). Trips start at $650 per person. You can try just about any water sport in Curaçao, but a particularly fun experiment is kitesurfing. Lessons are offered at the popular Nix Kite School, where certified instructors lead students on the beautiful and secluded St. Joris bay. Lesson range from two hours to five days of kitesurfing camp, starting around $70 per hour, though there's a discount if you come with a friend or in a couple. Fly through the air with the greatest of ease (and tons of very heavy rental equipment). For over 30 years, this family-run restaurant has been consistently voted the best on the island—guests love the service in addition to the food. Refined but not stuffy, the cuisine is French with Caribbean flair: a brandied bisque of rock lobster, say, or scallops in a wine and cheese sauce. It's all about the vibe at this beautiful but laid-back restaurant, which is attached to boutique hotel. Tables of wide wood planks sit under white umbrellas and overlook the sea. Breakfast, lunch, and dinner are served, but come for a cocktail and stay for a meal of fresh tuna tartare followed by seared grouper in a beurre blanc. While there are plenty of fancier options for dinner, Mijn Broodje Pietermaai is a great, casual lunch spot for a day touring Willemstad—it feels like a bit of hipster Brooklyn plunked down in the Caribbean. Sandwiches are delicious and super affordable, and the selection of coffee drinks and beers is wide. Dine under the bicycle that dangles from the ceiling, and chat with the wildly friendly staff to get even more recommendations for your stay. The ambiance at this restaurant seems entirely casual, with warm-wood tables and few walls, until the food arrives. Mediterranean dishes are plated in spectacular fashion and taste even better than they looked; such elevated flavor combinations include roasted cauliflower with pomegranate and Vadouvan foam, or grilled tuna with okra and spicy sweet potatoes. 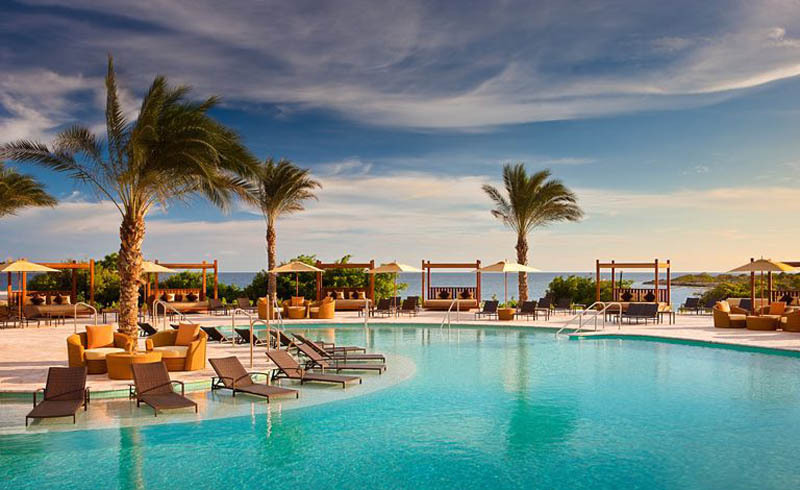 While Willemstad and the aforementioned adventures await around Curaçao, it'd be understandable if, after arriving at the Santa Barbara, you never wanted to leave. Situated on 2,000 acres, the resort has a private beach, multiple pools, restaurants, and bars, a spa, an 18-hole golf course, and one of the nicest tennis facilities in the Caribbean. The fine-dining establishment on the property, Shore, is a particular draw even for locals. This jolly red boutique hotel was converted from a historic villa just a few years ago, and so boasts stained-glass windows, balconies, and high ceilings. 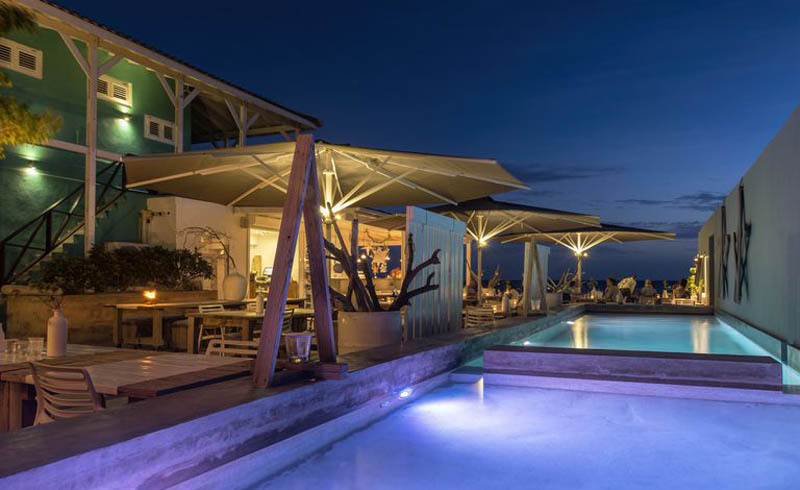 Lounge by the pool or walk into town, as several of Willemstad's best restaurants are just steps away. The hotel is run by a couple who live on-site with their three children, and they are happy to help guests with recommendations, reservations, and making them coffee in the morning. The Curaçao Sea Aquarium allows guests to feed sharks, swim with dolphins, and get kissed by sea lions, and in case that isn't fun enough, you can actually sleep on the aquarium's little private island, called Bapor Kibra. You can get a suite or a villa, which sleeps up to six people, and rooms are decorated in juicy shades of lime, banana, and orange.